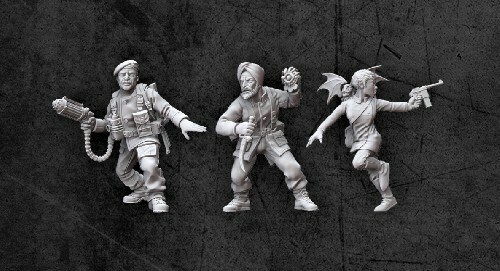 Three pewter metal miniatures of the heroes of Achtung! Cthulhu in 28mm scale - Achtung! Cthulhu miniatures are scaled to sit alongside other popular World War Two miniatures ranges. Comes with 3 x 30mm round display bases with raised lip, some assembly maybe required. Includes three members of Section M investigators; Captain Eric 'Badger' Harris and his anti-mythos steam gun cooked up by the chaps at Section M, French Resistance agent Ariane Dubois with the terrifying creature that let her live so it might feed on Nazi souls and Corporal Akhee 'The Eye' Singh who utters a few words and fights like an ancient hero as 'the eye' slowly opens - though each time, he knows that if the eye stays open, the world will end. Ariane can have her creature removed to create a normal investigator.